Ophthalmic instruments - special design of medical instruments used in eye surgery. Along with ophthalmic instruments used in ophthalmology and surgical instruments. Their purpose ophthalmic instruments can be divided into several groups. Instruments for the expansion of eye slits and retention century unfolded,velodyne (Fig. 1) and blepharoplasty (Fig. 2)in order to extend the wounds during operations, the creation of the nasolacrimal fistula - spring anoressizzanti (Fig. 3). A large group of ophthalmic instruments are different tweezers. To secure the eyeball in a certain position, necessary for operation, use the fixation forceps (Fig. 4). There are tweezers to hold the edges of corneal wound when imposing corneal seams (Fig. 5), for grasping the iris - the so-called iris-tweezers (Fig. 6), for grasping lens capsule during surgery removal of the lens in the capsule capsule tweezers (Fig. 7). For the pulling out of the front lens capsule with extracapsular cataract extraction is Mnogotochie capsule tweezers (Fig. 8). For extrusion trachomatis grains offered several tweezers: fenestrated, roller hook (Fig. 9), and other Destruction incorrectly growing eyelashes make with the help depilation tweezers (Fig. 10). Piercing and cutting tools: various types scalpels, knives, scissors, needle and chisel. Eye scalpels differ from those used in General surgery smaller and less sharpening angle. To cut the outer capsule of the eye is most frequently used in cataract knives - linear (Fig. 11) and spear. The latter are curved and straight (Fig. 12). For the application of notches on the conjunctiva and other purposes using a knife with a rounded top - scarificator (Fig. 13)dissection of the lachrymal channel - knife with Pugovkina thickening at the end (Fig. 14). Scissors are used in eye surgery, in the form of straight and curved, blunt - pointed, are characterized by small size. Original tweezers-scissors (Fig. 15) are intended for cutting off the iris and the outcome of the vitreous body. Removal of foreign bodies from the cornea using lanceolated needle (Fig. 16) or elaboate the bit (Fig. 17), for dissection bags front of the lens and the secondary cataract - decisionnel needle (Fig. 18). The purpose of dissection the front lens capsule use cystotomy (Fig. 19). For sutures used in ophthalmology very small surgical needles with cutting edges. Especially small should be needles for sutures on the wounds of cornea and sclera. To keep the eye of the needle use the needle holders of the small size. In eye surgery is also used various hooks, Trapani, probes, spoons, plates. Hooks are designed for gripping and excretion of the iris (Fig. 20), for grasping tendons eye muscles (Fig. 21), and other purposes. Various diameter Trapani used for trephination sclera glaucoma, corneal transplant. The probes are used for the removal of narrowing slezo-outlet ways: to expand the tear points and lachrymal channel - conical probes, to extend the nasolacrimal channel probe diameter 0.5-1.5 mm (Fig. 22). Spoon used in ophthalmic surgery, are of two types. One is used for the removal of the nucleus of the lens or cataract of the masses by cataract (Fig. 23), other (sharp spoon round shape) used in the removal of pterygium. During operations on eyelids apply plate with weakly convex front and slightly concave rear surface (Fig. 24). There are special sets ophthalmic instruments required for the production of major eye operations. The tools in the Toolbox are placed in mobile boxes. Cutting eye tools (knives, Trapani, scissors) should have a maximum severity. Therefore, in addition to manual or mechanical polishing of these tools, final finishing their blades produced by electrolytic. The severity of these instruments is checked by a trial piercing or cutting thin suede or waxed paper. Sterilisation and storage ophthalmic instruments - see Sterilization surgery, Surgical instruments. 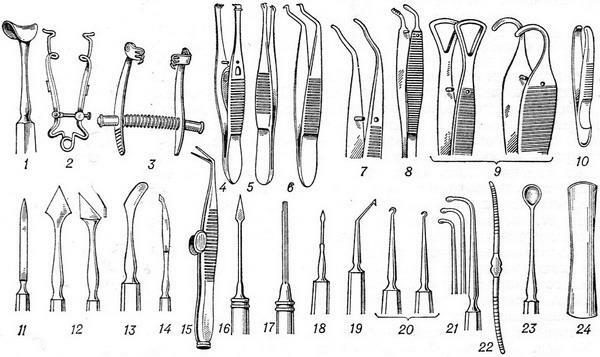 Ophthalmic instruments. Made of carbon or stainless steel, at least from the brass. Stainless steel tools only polished and made of carbon steel or brass electrolytic covered by anti-corrosion layer of Nickel or chromium. Cutting and piercing instruments must have a maximum severity. They hone mechanically (by grinding machines), manual (on fine-grained white touchstone - Arkansas) or electrolytic (by anodic dissolution of metals). The severity of tools examine under a microscope, a trial basis and cutting thin suede or bosanki that for this purpose pull on a special drum. For the expansion of eye slits are velodyne Gamarra (Fig. 1), blepharoplasty holding eye slit open with curved plates; for ever, and bent springs, arching these plates (Fig. 2). Similarly arranged and some anoressizzanti used for expansion of the wound edges with the destruction of the lacrimal SAC or dacryocystorhinostomy. In ophthalmic surgery is used for many different purposes of tweezers. Tweezers for grasping the conjunctiva differ from anatomical and surgical feet: they expanded slightly, slightly bent inwards and lower-internal surfaces have many small teeth. Fixation forceps Gref (Fig. 3)that secure the eyeball capture for the conjunctiva, with a spring latch. Tweezers for iris and capsular tweezers, designed to capture the lens capsule, are curved at an obtuse angle thin legs with hooks at the ends. Tweezers Bellarmino for extrusion trachomatis grains has fenestrated Lanka for grasping the folds of the conjunctiva or all strata turned century with the purpose of their compression during traction (Fig. 4). In ophthalmic surgery is often used special tweezers with screw clamps. They are intended for smoothing and compression century, and also for protection of the eyeball from accidental cuts during the operation, allowing to operate for centuries bloodless. These are tweezers, Damara and Snellen (Fig. 5 and 6), the final part of the rear branch which is thin, curved, Balnur or rectangular plaque. The end of the front paws, respectively outer edge of the rear plate looks oval rings (tweezers, Demarre) or arc (tweezers Snellen). Tweezers, Demarre used in the removal of limited tumors century, tweezers Snellen - in operations concerning traumatologia inversion of eyelids. For cuts in operations on eyelids, orbit and tear bodies apply the usual pointed and pushistye scalpels (Fig. 7 and 8), which differs from the surgery only to its small size and smaller angle of taper (15-20th). For sections of the eyeball following his puncture using a special knife. Linear cataract knife Gref (Fig. 9) has a long narrow blade size 2 mm wide and 30 mm long with a well-shaped end. Lanceolated knives Eger, direct, or more often curved (Fig. 10), have the form of an isosceles triangle. To cut the sclera outside use, scarificator Gref (Fig. 11), intended for conducting cuts conjunctiva with its large swelling, or special scleral knife Plytas, reminiscent of cataract, but with a rounded end, deflected towards the back (Fig. 12). The lachrymal channel cut with a knife Weber (Fig. 13), is also reminiscent of narrow cataract knife, which turns into a short cylindrical rod with a small rounded thickening at the end. For cutting tools are and eye Trapani Elliott for the trepanation of the sclera (Fig. 14), and special Trapani for keratoplasty, for example trepan Filatov - Marcinkowskiego. In eye surgery is used a lot piercing instruments: bent spear needles for extraction of foreign bodies from the cornea (Fig. 15), decisionii lanceolated needle Bowman (Fig. 16). For tattoo Belm cornea used globauto needle (Fig. 17). For dissection bags lens is designed hook cistota Gref (Fig. 18), the cutting part of which has the form of a triangular prism, well pointed at the end. Scissors are used in ophthalmic surgery, characterized by small sizes. The most common curved on the plane scissors Cooper. Besides them, use a straight scissors or curved on edge scissors Richter. Excision of the iris is tweezers-scissors Vechera. They consist of two equal halves; the vertical part reminds tweezers, and the horizontal is a short and narrow branch of scissors, which closed at squeeze both halves vertically located arm (Fig. 19). For grasping external tendons of muscles of the eye apply stupid hook, bent at right angles (Fig. 20). Double sharp hooks (Fig. 21) used to extend the operating wounds, and single hook Gimli (Fig. 22) - to retrieve iris. For expansion of the lachrymal channel, and sensing the nasolacrimal channel used conical and longer obtuse probes Bowman (Fig. 23 and 24). For washing lesoproduktsii ways adapt ordinary syringe with blunt cannula or use a special syringe Asnelles (Fig. 25), with straight or curved at an angle hollow tips introduced into the lacrimal tubule. Original ophthalmic instruments are the record of Eger (Fig. 26), playing the role of a wide spatula, which straightens the eyelid and narrow cataract spatulas, which are designed to napravleniya fallen iris (Fig. 27). Spoons used in ophthalmic surgery, there are blunt and sharp. Blunt spoon of Davies (Fig. 28) used in the extraction of cataracts. She has stupid polished edges. For the same purpose use of cataract loop Weber in cases of dislocation of the lens or the kernel into the vitreous body (Fig. 29). Of acute spoons for the evisceration of the eyeball apply broad flat spoon Bunge (Fig. 301, for the recovery of pterygium - sharp round spoon of Magiera (Fig. 31). For joints used needles small size with springy or simple eye, and small atraumatic needles. 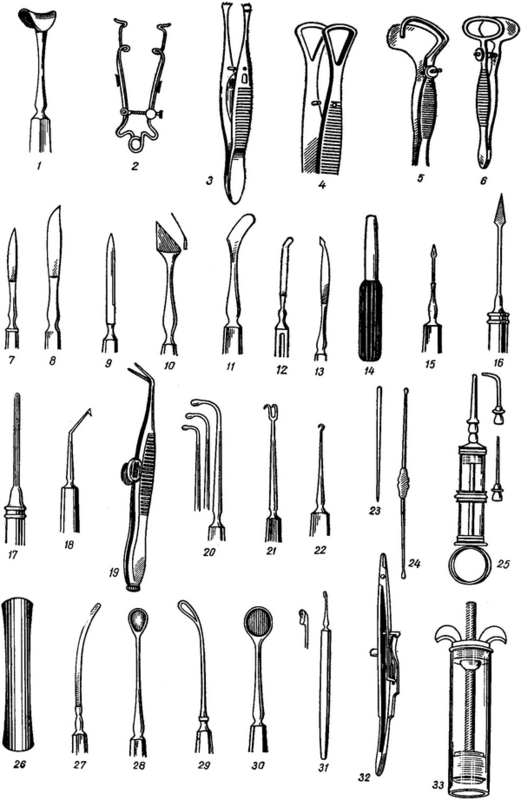 From various systems needle holders of the most common needle holder found (Fig. 32). In order to krovoobrascheniya apply artificial eye leech Hertle - glass cylinder with a piston (Fig. 33). The lower end of the cylinder is put in the temple after the incision of the skin. The blood is removed when raising the piston under the action of vacuum formed in glass below cylinder piston.